This study used comparison with videofluoroscopic examination of swallowing (VFES) to examine the validity of a 100-ml water swallowing test (WST) in assessing swallowing dysfunction. 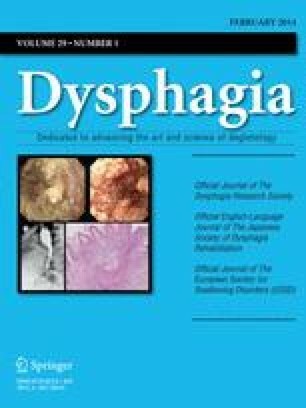 Fifty-nine consecutive outpatients (15 females, 44 males) with clinically suspected dysphagia were enrolled in this study. Each subject underwent a 100-ml WST followed by VFES. Data was obtained on swallowing speed and signs of choking (coughing and a wet-hoarse voice). The analytical results revealed that 49 subjects had abnormal swallowing speeds (< 10 ml/s) in the 100-ml WST, and 47 of them were identified as having dysphagia by VFES. Among the ten participants with normal swallowing speed (> 10 ml/s), eight were diagnosed with dysphagia by VFES. Notably, 14 participants choked in the 100-ml WST, 11 of whom exhibited aspiration or penetration in VFES. Among the 45 participants without choking in WST, 12 displayed aspiration or penetration in VFES. The sensitivity of swallowing speed in detecting the swallowing dysfunction was 85.5%, and the specificity was 50%. Moreover, the sensitivity of using choking or wet-horse voice in the 100-ml WST as the sole factor for predicting the presence of aspiration was 47.8%, while the specificity was 91.7%. Therefore, this study concluded that swallowing speed is a sensitive indicator for identifying patients at risk for swallowing dysfunction. Moreover, choking in the 100-ml WST may be a potential specific indicator for followup aspiration.